From the toolbar, click the Create a Turtle button. Then in the workspace, click to hatch a turtle. In the Command Center, type the command pd and press the Enter (Windows) or Return (Mac) key to set the turtle pen down. Now, whenever the stylus turtle draws, it will leave behind a mark on your workspace. Next, you need to paint a shape for the stylus. Click the project Shapes tab (which is located in the lower-right corner of the window). On the project Shapes tab, double-click any shape spot. 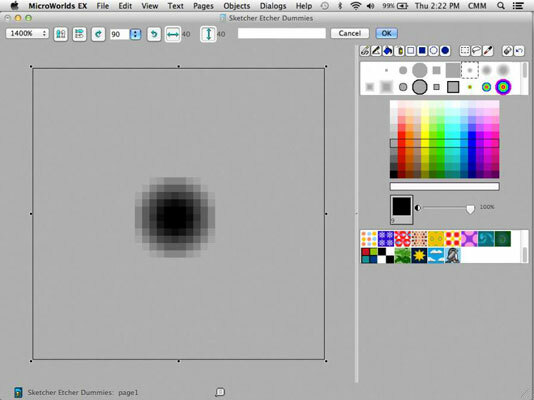 In the Shape Editor, click the Pencil tool and a small, faded brush. Then click in the center of the drawing area to create an Etcher drawing stylus and click OK. The completed Etcher drawing stylus appears on the project Shapes pane for you to use. 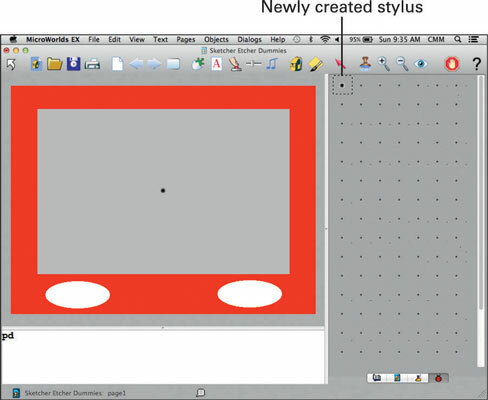 Click the stylus on the project Shapes pane and then click on the turtle in the workspace. The turtle now wears the shape of the stylus. In your workspace, if you accidentally click somewhere other than the turtle, the stylus shape appears on the background. To remove it, simply right-click (Windows) or Ctrl-click (Mac) the shape and select Remove from the pop-up menu.